The Commons is a concept and practice that has been steadily gathering increased attention and advocates. Deeply rooted in human history, it’s difficult to settle on a single definition that covers its broad potential for social, economic, cultural and political change. The Commons is now demonstrating its power as a “key ingredient” for change in diverse locations and contexts around the world. The P2P Foundation, with its particular focus on the relationship of the Commons and P2P practices, is supporting this Commons transition by helping to share knowledge and develop tools to create common value and facilitate open, participatory input across society. 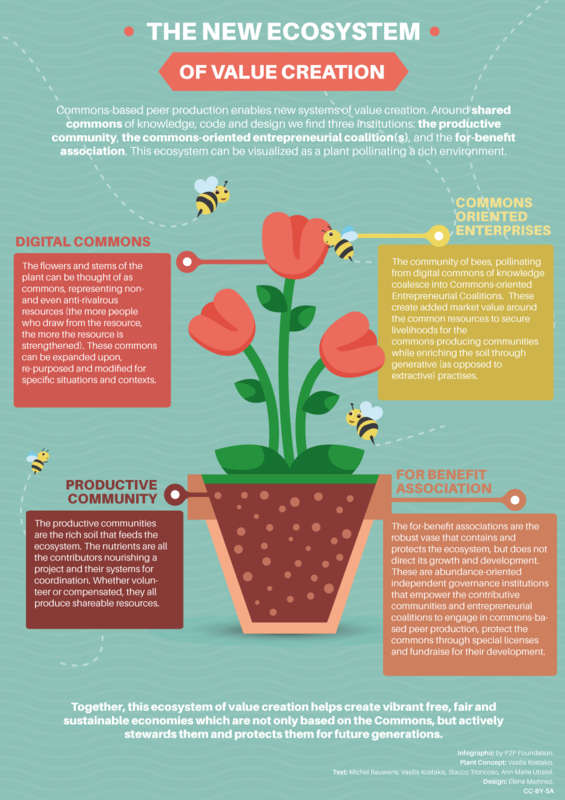 This short primer, co-published with the Transnational Institute explains the Commons and P2P, how they interrelate, their movements and trends, and how a Commons transition is poised to reinvigorate work, politics, production, and care, both interpersonal and environmental. Drawing from our ten year + history researching and advocating for P2P/Commons Alternatives, the Primer is structured in a Q&A format, providing answers to questions such as “What are the Commons, what is P2P and how do they relate together?” “What are P2P Economics?” “What are P2P Politics?” and, more important, how these different factors can combine together at higher levels of complexity to form a viable transition strategy to solid post-capitalist system that is respectful of people and planet. The Primer features explanations for some of the key concepts we handle, as well as various case studies and infographics. It was co-written by Michel Bauwens, Vasilis Kostakis, Stacco Troncoso and Ann Marie Utratel and designed by Elena Martínez, from the P2P Foundation. The Commons Transition Primer is a year-long multimedia project/campaign aimed at making the world of the Commons and P2P more comprehensible and attractive to commoners worldwide. This publication will be followed up by a website, video material and events. In 2018 we will culminate the process with a full-length publication on the Commons Transition co-authored by Michel Bauwens and Vasilis Kostakis. Michel Bauwens, co-founder and core team member of the P2P Foundation, is a Belgian Peer-to-Peer theorist. An active writer, researcher and conference speaker on the subjects of technology, culture and business innovation, he is the Vision Coordinator for the P2P Foundation. Vasilis Kostakis is the founder and coordinator of the interdisciplinary research hub P2P Lab that investigates the socio-economic and political impact of free and open-source technologies. He was the Research Coordinator and is now a core team member of the P2P Foundation. Stacco Troncoso is a core team member and Advocacy Coordinator for the P2P Foundation. A co-founder of Guerrilla Translation, his work in communicating commons culture extends to public speaking and relationship building with prefigurative communities, policymakers and potential commoners worldwide. Ann Marie Utratel is a core team member of the P2P Foundation working in advocacy and infrastructure. She is also a co-founder of Guerrilla Translation and contributes narrative storytelling and collaborates in strategic alliance building for the larger P2P/Commons ecosystem.